The Prince-Bishopric of Liège around 1350. This map shows the pre-1559 medieval Diocese of Liège (in green) which evolved from the Civitas Tungrorum and probably had similar boundaries. The large diocese of the medieval bishops was, until 1559, much larger than the princedom which was in their possession. However, the princely domain was gradually enlarged by donations and by acquisitions. In the 10th century, the bishops received secular power over the county of Huy, which lay within of the diocese. Bishop Notger (972–1008) thus became a sovereign prince. 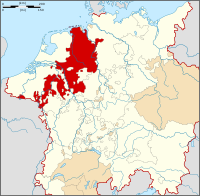 This status was retained by his successors until the French Revolution, and throughout that period of nearly eight centuries the Prince-Bishopric of Liège succeeded in maintaining a level of autonomy, though theoretically it was part of the Holy Roman Empire. This virtual independence was owed largely to the ability of its bishops, who on several occasions played an important part in international politics, being strategically positioned between France and Germany, . Throughout the Middle Ages, the prince-bishopric was further expanded with the lordship of Bouillon in 1096 (ceded to France in 1678), the acquisition of the county of Loon (French: Looz) in 1366 and the county of Horne in 1568. Notger, the founder of the principality, also rebuilt the cathedral of St Lambert, as well as the episcopal palace. He was also involved in other building activities in the city, which flourished under his rule (churches of St Paul, St. John the Evangelist, Sainte-Croix and St Denis). This bishop also strengthened the parochial organization of the city. He was one of the first church leaders to spread the observance of All Souls' Day, which he authorized for his diocese. Under Notger's administration, following up on the work of Heraclius, educational institutions in Liège flourished. With these two bishops (and Wazo) "The schools of Liège were, in fact, at that time one of the brightest literary foci of the period". In the 11th century the city was indeed known as the Athens of the North. "Liège for more than a century occupied among the nations a position in regard to science which it has never recovered". Subsequent bishops, Balderic of Looz (1008–18), Wolbodo (1018–21), Durandus (1021–25), Reginard (1025–38), Nitard (1038–42), the learned Wazo, and Theoduin (1048–75), valiantly sustained the heritage of Notger. The schools formed many brilliant scholars, and gave the Catholic Church popes Stephen IX and Nicholas II. The diocese also supplied the University of Paris with a number of important doctors — William of Saint-Thierry, Gerard of Liège and Godfrey of Fontaines. Alger of Liège (1055–1131) was an important intellectual of the period. He was first appointed deacon of church of St Bartholomew and finally retired at the monastery of Cluny. In the reign of Henry of Verdun (1075–91) a tribunal was instituted (tribunal de la paix) to prevent war and enforce the Peace of God. Otbert (1091–1119) increased the territory of the principality by purchasing the Lordship of Bouillon. He remained faithful to emperor Henry IV, who died as his guest. Henry of Namur (1119–21) was venerated as a martyr. During the administration of Alexander of Juliers (1128–34) the pope, the emperor and St Bernard visited Liège. The episcopate of Raoul of Zachringen was marked by the preaching of the reformer Lambert le Bègue, who is credited with founding the béguines. Albert of Louvain was elected Bishop of Liège in 1191, but Emperor Henry VI, on the pretext that the election was doubtful, gave the see to Lothair of Hochstadt. Albero's election was confirmed by the pope but in 1192, shortly after he took office, he was assassinated by three German knights at Reims. It is probable that the emperor was privy to this murder but Albero was canonized. In 1195, Albert de Cuyck (1195–1200) formally recognized the political franchise of the people of Liège. During the 12th century, the cathedral chapter, along with the bishop, assumed a more important role in the history of the principality. The struggles between the upper and lower classes, in which the prince-bishops frequently intervened, developed through the 13th and 14th centuries, and culminate in the 15th century in the pillage and destruction of the episcopal city. In the reign of Robert of Thourotte (1240–46), Saint Juliana — a nun of Cornillon Abbey — was led by certain visions to the project of having a feast established in honour of the Blessed Sacrament. After much hesitation, the bishop approved of her idea but death prevented the institution of the feast. The completion of the work was left to a former prior of the Dominicans in Liège, Hugh of Saint-Cher, who returned to the city as papal legate. In 1252 Hugh made the feast of the Blessed Sacrament an obligation throughout his diocese. John of Troyes, who, after having been archdeacon at Liège, was elected pope as Urban IV, encouraged the observance of the feast of Corpus Christi in the whole Church. Another archdeacon of Liège became pope under the name Gregory X and deposed the unworthy Henry of Gueldres (1247–74). The Peace of Fexhe, signed in 1316 during the reign of Adolph II de la Marck (1313–44), regulated the relations between the prince-bishop and his subjects. Nevertheless, internal discord continued and the episcopate of Arnold of Horne (1378–89) was marked by the triumph of the popular party. In 1366, the county of Loon was annexed to the bishopric. Upon the death of Louis of Male, count of Flanders, in 1384, the Low Countries began their unification within the Burgundian Netherlands. Though the Principality was still nominally independent, the Dukes of Burgundy have had an increasing influence on its government. Louis of Bourbon (1456–82) was placed on the throne of Liège by the political machinations of Philip the Good, Duke of Burgundy. The population resisted Burgundian rule leading to the Liège Wars, the destruction of Dinant in 1466, and of Liège in 1468 by Charles the Bold, marking the ending of democratic ascendancy in the Principality. Charles V completed the union of the Seventeen Provinces in the 1540s, and unofficially also controlled the principality. He nominated Erard de la Marck (1505–38) who brought a period of restoration. Erard was an enlightened protector of the arts. It was he who commenced the struggle against the Protestant reformers, which his successors carried forth, especially Gerard of Groesbeeck (1564–80). With the object of assisting in this struggle, Paul IV, by Bull (Super Universi, 12 May 1559), created new bishoprics in the Low Countries. The new bishoprics were created largely at the expense of the diocese of Liège; many of its parishes were given to the dioceses of Roermond, 's-Hertogenbosch, and Namur, or were added to the existing dioceses of Mechelen and Antwerp. The number of deaneries in the diocese of Liège was reduced to 13. Liège formed the last link in the chain of Habsburg allies that made up the so-called Spanish Road, a military corridor between Spanish-controlled Lombardy and the Spanish Netherlands. Completely encircled by Spanish territory, Liège was protected by treaties of neutrality which permitted the passage of Spanish troops through the prince-bishop's territory provided that they spent no more than two nights in one place. The importance of the prince-bishopric to Habsburg military logistics in the Eighty Years War prompted Spanish intervention foiling a Dutch invasion in 1595. Most of the bishops in the 17th century were foreigners, many of them holding several bishoprics at once. Their frequent absences gave free scope for those feuds of the Chiroux and the Grignoux to which Maximilian Henry of Bavaria (archbishop of Cologne, 1650–88) put a stop by the Edict of 1681. In the middle of the 18th century the ideas of the French encyclopedists began to be received at Liège; Bishop de Velbrück (1772–84), encouraged their propagation and thus prepared the way for the Revolution Liégeoise. Partially connected with the French Revolution, a protest against the absolutist rule of prince bishop Cesar Constantijn Frans van Hoensbroeck developed into the 1789 Revolution in Liège. At the beginning of 1791, the revolution was crushed by troops on the orders of the Holy Roman Empire. The prince-bishopric was dissolved in 1795, when it was annexed by France. Its territory was divided over the départements Meuse-Inférieure, Ourthe, and Sambre-et-Meuse. ^ Gross, Joan (2001). Speaking in Other Voices: An Ethnography of Walloon Puppet Theaters. John Benjamins Publishing. pp. 14–17. ISBN 978-9-0272-5110-7. Retrieved 13 November 2017. ^ Edmundson, George (1922). "Chapter II: Habsburg Rule in the Netherlands". History of Holland. Cambridge University Press. Retrieved 9 June 2007. ^ Parker, Geoffrey (1972). The Army of Flanders and the Spanish Road, 1567–1659: The Logistics of Spanish Victory and Defeat in the Low Countries' Wars. London: Cambridge University Press. p. 61.